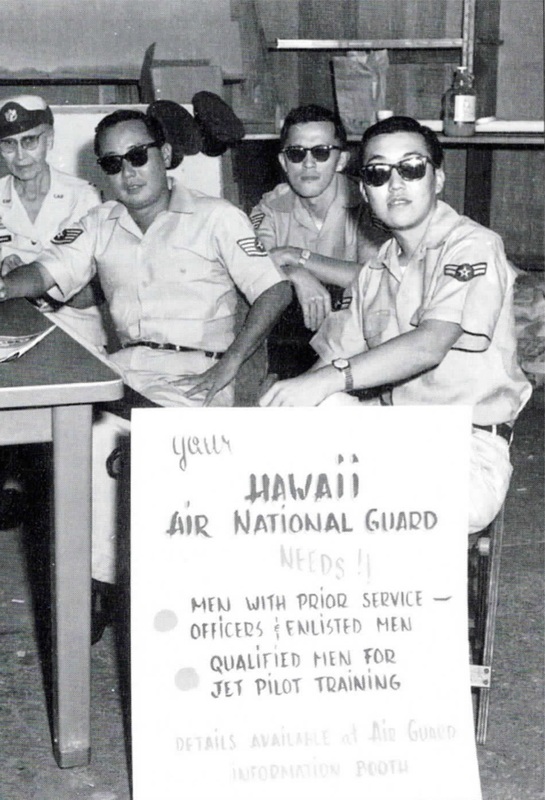 This photograph is from the HIANG 50 book that documented the first 50 years of the Hawaii Air National Guard. Based on uniforms and ranks, this photograph was taken in the late 1950s/early 1960s. The location is unknown. In the photograph (L-R): unknown, Charles Tasaka, Roy Chee, Richard Fukui. The female member is unidentified. She was a WAF – Women in the Air Force – were organized in 1948 and remained active until 1976. Charles “Charlie” Tasaka, served in the personnel and admin career fields during his career. He served at the 169th Aircraft Control & Warning Squadron, the 201st Combat Communications Group, and at Hq, Hawaii Air National Guard, where he was promoted to chief master sergeant. To take a position in the Human Relations Office, he transferred to Hawaii Army National Guard, where he served as a master sergeant. When he retired, Charlie reassumed his highest grade held. Roy Chee, also served in the personnel and admin career fields. He served in the 169th Aircraft Control & Warning Squadron, and the 201st Combat Communications Group. He retired as a senior master sergeant. Richard Fukui initially served in the aircraft control and warning units. Later in his career, Richard became a recruiter. His last assignment was at Hq, Hawaii Air National Guard, where he served as the lead recruiter for the HIANG. Richard retired as a senior master sergeant. Richard was a talented musician who performed in local clubs. All were knowledgeable and did their jobs well.